Looking to deck out a table for your next trade show or event? We’ve got you covered – literally! Tablecloths, stretch table covers, table throws, table runners, and so on. There are numerous products out there to cover a table but, are they all the same thing? Does it matter which one you use? What are the pros and cons of each one? We’re going to focus on the three most popular table covers in the industry: table throws, table runners, and stretch table covers. We’ll take a look at the features of each unique product, showing you the many ways you can make your table an effective marketing tool. There’s a good chance that the word ‘table cloth’ is thrown around when trying to describe professional table covers. Though a table cloth does cover a table, it is far from the quality and purpose of a professional cover. Table cloths are typically designed for decorative and practical use in protecting a table from damage at dinners and parties. Most are disposed of after a single use and are made from either a lightweight paper or a thin cloth material. The cloth ones of course gets washed after being used and stored until the next family gathering or holiday. On the other hand, professional table covers are designed for use as a marketing and advertising medium. High-quality and reusable, professional covers are made to last for years, with incredibly vibrant images and colors. Clean, crisp, and eye-catching table covers are what you need for professional uses and settings. Let’s take a look at each type of these covers. Table throws are designed to have a large printing area for effective advertising. Table throws are the most common of the professional table covers because of their ability to entirely cover most trade show tables without any hassle. Table throws typically come in two sizes, a 6 foot and an 8 foot length (both of which fit tables of the respective length – these are the most common among trade show tables). The pleated corners of the table throw are practical and stylish. It’s common for table throws to have pleated or hemmed corners, which allow the throw to form-fit around the edges of the table. This adds to the professional appearance while offering a loose, yet snug fit. Of course, the selling point for table throws is the massive design area. Table throws can be decked out in logos, text, images, photos, and whatever else you can think of without a limit to where on the throw it’s placed. All five sides or surfaces are printable! This is easily done in our online sign designer when ‘Table Throw’ is selected in order to let you design your custom table throw however you need it. Table throws are great for display at any professional or casual event. From trade show booths to school fundraising events, there really isn’t a limit to how you can implement table throws for your tabletop display. Table runners are great for displaying on tables that are already covered. Table runners are a unique blend of simplicity and functionality. As the name suggests, these ‘covers’ are more-so runners, or in layman’s terms, a narrow, long strip of fabric material. That being said, table runners do not cover the entire table like a table throw or a stretch table cover. 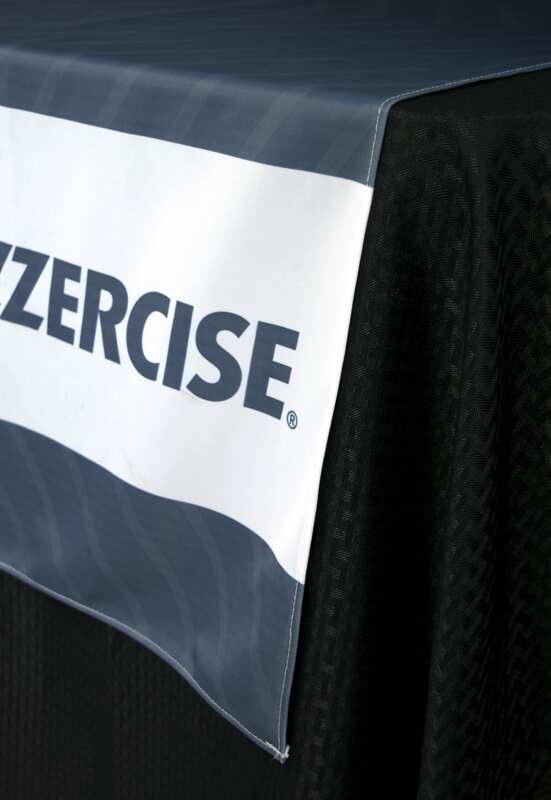 Table runners are a simple marketing material that can offer increased brand awareness. Table runners are designed to fit on tables with a table cover already displayed. This isn’t necessary, but it helps the overall aesthetic of the display. Runners are considered to be easily swapped in and out depending on the display needs. The variety in width of table runners gives you plenty of flexibility in how big or small your design can be. Table runners are offered in various widths, ranging from 24” to 60” wide. Having a range of sizes means there’s plenty of options when it comes to designing a table runner that fits the width of the table (and gives you more or less design area depending on your preference). Even though table runners are commonly displayed at trade shows and conventions, they are also perfect for display at casual events like bake sales, back-to-school nights, yard sales, food truck stands, and vendor booths. 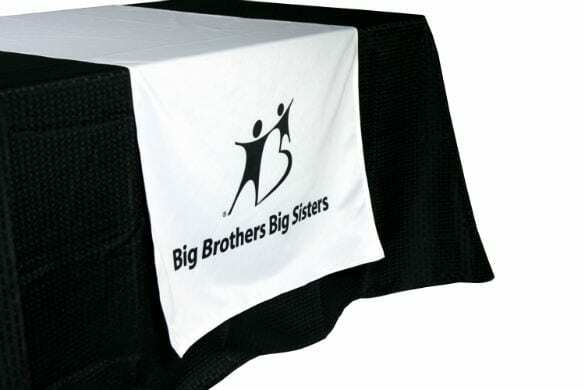 Stretch table covers transform tables into a bold marketing tool. 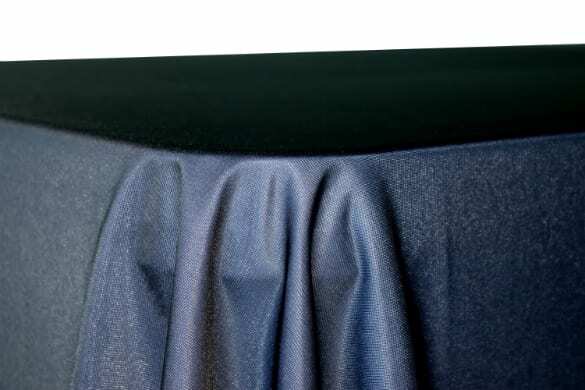 Stretch table covers are unique, stretchable, and extremely sleek looking; you can consider these as the European sports car of table covers. You wouldn’t think there’s anything fancy about a table cover but you’d be surprised. Stretch table covers are made from a polyester tension fabric, which forms to the frame of the table and uses reinforced pockets at the bottom of each leg to retain its tautness, giving it a crisp appearance that’s unrivaled in the table display industry. The open back allows you to hide away boxes and other materials for trade shows and events. Stretch table covers are completely customizable and offer complete coverage of the table, while leaving the back of the table open. The opened back means storing and retrieving items is quick and easy. As both the images show, the printed design of the table cover will literally wrap around the table, giving a unique visual effect that will impress at any angle. Since stretch table covers are designed for visual impact, they are typically used in professional settings, such as trade shows, conventions, product demonstrations, and company events. Now that you know the unique features of the three most popular table covers out there, it’s time to choose the one for you! Still not sure what you need? Don’t worry, we’ve made a summary below with the list of features that set each table cover apart so you can choose the one that fits your needs. If there’s still hesitation on what table cover would be best for you, please give us a call at 888-222-4929. We’d love to help you choose the best option for you! Need help with your design? We offer free design services to help you out creating the best table cover design for your needs!